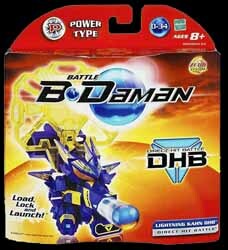 The B-Daman line is all about custom-building figures for different gaming styles. Figures feature fully interchangeable armour so kids can swap parts from their collection of figures to create the ultimate marble warrior. Gaming is easy to pick up and great fun. There are eight different character figures in the Direct Hit Battle (DHB) range. 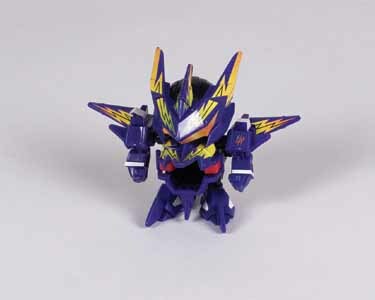 As with the rest of the figures in this collection, Lightning Kahn has been designed so that you can remove its helmet, shoulder armour and foot armour. Once you've built your character you can fire marbles, from a specially designed chute, at your enemies. To win you simply have to disable your opponent's DHB target. While you can battle your friends on a table or other smooth surface, you really need to invest £20 to buy the D-Daman Tournament Set. This will not only give you a guaranteed level playing field, but it also has the advantage of coming with numerous cool add-ons to ensure that your skill is tested to the limits. It also has the added attraction that you can spend hours honing your skills on your own, to ensure you wipe the floor with your friends. Hasbro has come up with a bit of a winner here. Cheap, fun and very collectible, this range is sure to become an instant hit with school children everywhere.